Hello all, My name is Jim and this will be my second year at SFG gardening. I started off with a 70 square foot garden last year but since I sold my house in July I only got to see some of the fruit of my labors. In that short amount of time my family was able to grow short and full size carrots, bush green beans, grape and cherry tomatoes, and lettuce. Sadly, we had to leave before the cucumbers, pickles, zucchini, and watermelon had a chance to really take off. The new house is nice but there is a lot of shade from mature trees throughout the lot. Instead of building a new bed, I was lazy and bought a 4’x8′ cedar bed from Home Depot. Only time will tell if it holds up to the harsh seasons here in Chicago. Due to having limited amounts of full sun bed locations, I’ve decided to use the new bed for cold season veggies and I’m currently building self-watering bucket planters for the warm season veggies; tomatoes, zucchini, cucumbers, strawberry and pepper plants. I’m hoping for the same success as last year and the chance at doing a fall planting. If anyone has any knowledge on bucket gardening,i.e. how many plants per 5 gallon bucket or which plants do well please let me know. Also, I’ve noticed a large amount of rabbits/squirrels in the new yard. Any idea how high to make a fence to keep them out of the garden. I want to build it high enough to keep the animals out but short enough for my young kids to still help harvest. 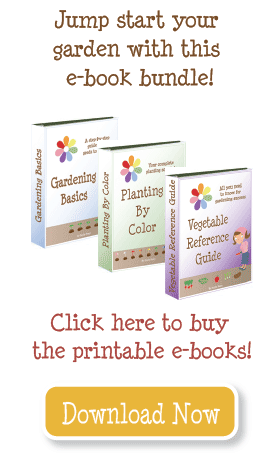 Thanks to this site and Mel’s book I was able to successfully introduce my kids to gardening and loads of healthy food. Watch the potatoes. They grow wild next year as you dont always find all of them and the branches spread out. This year I made burlap bags and my potatoes are growing in them so they are contained. I live in CA so grow them all winter long for summer crop. Have also used the HD cedar beds for a couple of years and they seem to be holding up fine in orange/brown zone with plenty of rain. The side boards are not that thick, so you need to be careful using a shovel near the edges to avoid damaging the sides. Also, we had to dig out some soil in the lower bed of the two-level you are using to be able to have deep enough soil for large plants like tomatoes. Also, have several that are two kits stacked one of top of the other to make then twice as deep. After making a number of beds from scratch, using the precut cedar is not a bad deal. Beware the garden bed kits on legs sold by HD – really flimsy. Jim, this looks great! You’ve inspired me. I’m planning to do a small garden myself this spring. 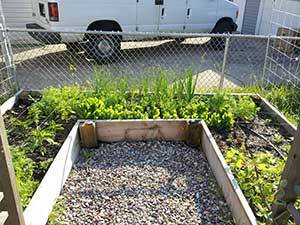 I’m a south sider with a pretty small yard and actually was searching for info on raised beds when I found your post. Outside of my kids play equipment, I could probably fit about 2 of those boxes that you got from Home Depot – thanks for that tip by the way because I was finding that kits and lumber were more expensive in the Chicago area than I thought. Anyway, I’m really impressed by the layout plan that you have here. Room to plant many more vegetables than I thought. Can’t wait to start this with my kids in the spring! Looks good! We used the same cedar raised bed from HD this summer and it weathered fine. We’re about 3 hours SE of Chicago, so in a similar zone as you. For what it’s worth, we get 5+ years out of our untreated wood beds, so we expect to do even better with cedar. As for the leaf lettuce, I agree with 4 per square. Sometimes I pushed it to 5 per and harvested the one in the middle first; that worked pretty well, too. Nice! 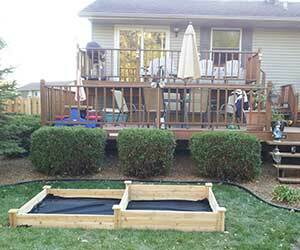 You can build a cover/lid with chicken wire, 1×2’s or 1/2″ pvc pipe, and zip ties. I wouldn’t build a 4 x 8 cover, but two 4 x 4 covers. It would be easier to handle. When you want to garden, you can just lift it off. I’m not sure how big the beans get, but you may want to put them on an end so you can build a shorter cover for the smaller veggies and then maybe a bigger one for the beans. Have fun! Your new home and garden look beautiful! I really like your placement–it will make it so easy to go out to your garden and check on things. Even though you didn’t build the new garden yourself, it looks great. As for the plan, there are a few spacing things that are different than what I do. I plant leaf lettuce only 4 per square, and head lettuce 1 per square. Bush beans I will plant 9 per square–they do start taking up a lot of space, but you can tie a string around the whole square to keep them a little more contained. And I give broccoli just a little more space. One way you might adjust it–put your broccoli next to your carrots. The broccoli is going to go into the ground the third to fourth week of March. 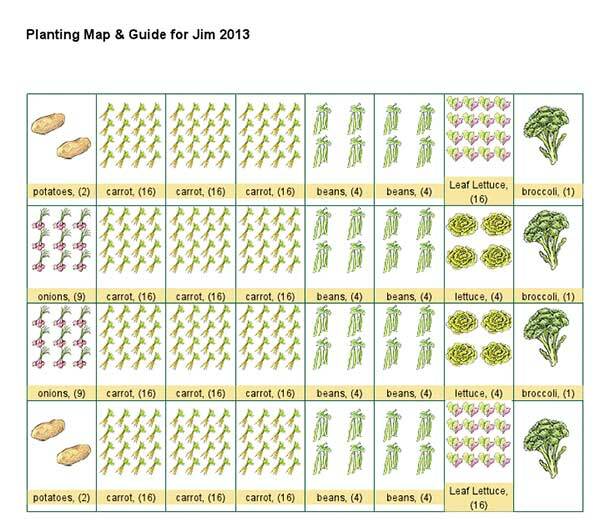 The carrots can be planted the second week of April (these dates are all for the Yellow group). By the time the carrots need more space/sunlight, you will have harvested the broccoli. Lettuce matures more quickly, so I would not want to deprive it of space or sun.